At 270 ft of length the Ocean Carrier is a true multifunctional platform. 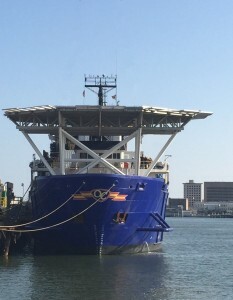 Currently the Ocean Carrier is outfitted with DPII, 150T heave compensated crane, and an 8-man saturation dive package. 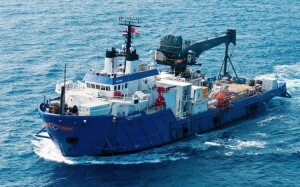 The Ocean Carrier makes a positive contribution to any offshore maritime project. The DPII-DSV Ocean Carrier started 2015 with a bang by receiving some impressive upgrades. The 270’ vessel spent 5 months at Gulf Copper Shipyard in Galveston, Texas undergoing routine maintenance as well as completing her 5 year Special Surveys. The vessel’s crew, along with Stabbert’s engineering team and support from Stabbert Yacht & Ship, performed full overhauls on all 4 thrusters, the main engines, and steering units. Nearly 120 tons of steel was replaced, and a full inspection and load test was conducted on the 150T crane. Significant upgrades were also made to the accommodation units and galley. In addition to the overhauls and steel work, the vessel added a 66’ diameter aluminum heli-deck, capable of housing a medium weight Puma L1 helicopter. This addition makes the OCEAN CARRIER even more competitive in the Gulf of Mexico, where she is currently operating.